Due to the success of the first streamer fishing video we did on how to fly fish a streamer fly we had to do another. In this advanced streamer fly fishing video we go much more into the variety of streamer fly patterns that have been recently developed and the new streamer fly fishing rods and streamer fly lines that have come onto the market. Kelly breaks today’s most popular streamer fly patterns down into a number of categories and then explains how to fly fish streamer flies in each group. Along the way you get to see Kelly streamer fly fish some of the West’s greatest trout waters including: the Madison, Wind River, and South Fork of the Snake. The result is you will see new ways to fish streamer flies and discover a host of new streamer fly patterns to try out. The first streamer flies for trout were probably the wooly buggers but Kelly spent a lot of time creating bigger streamer patterns because he was looking for a way to trigger resting big trout into attacking. This led Kelly into crafting articulated streamer flies for trout that are now the rage if you are going to hunt trophy trout with streamer flies. You will get a good look at the hot streamer fly patterns on the market today. Streamer fly pattern colors are critical to Kelly’s system and in this streamer fly fishing video he details how to sequence your streamer fly colors as you fish them. He all so talks about weighted versus non-weighted streamer flies and how this determines how to fly fish a streamer fly. Fly fishing streamer flies with a dry line, fishing with a weighted fly line, and fly fishing streamers using a jigging method are all covered. New tactics, gear, flies and lessons for catching bigger trout. Discover, in this ninety-minute action and information packed video, the flies, casts, and retrieves that will help you catch the largest trout in your waters. Kelly Galloup is the angler and author most responsible for the renewed interest in streamer fishing on fly waters around the world. His book, videos, and fly patterns have proven his “Big Fly Big Fish” approach, and it’s catching on everywhere. 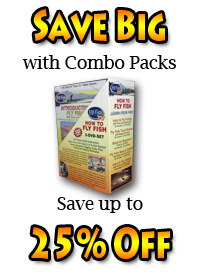 Both Dry and Sinking Line flies, presentations, and retrieves are explained and demonstrated in detail. Understand when and how to use one line versus the other, and see what a difference a slight change in your tactics can make. Fly selection is critical when trying to deceive large trout and Kelly shows his top creations along with a host of other popular patterns. Three Great Trout Rivers are featured in this fish-filled look at the latest in streamer angling gear and methods. See the Wind River Canyon in Wyoming and the big bows and browns that make it famous. Float the South Fork of The Snake River in Idaho where native cutthroat charge the well-presented streamer. Finally join Kelly on the Madison River and let him show you new ways and patterns for fishing streamers.